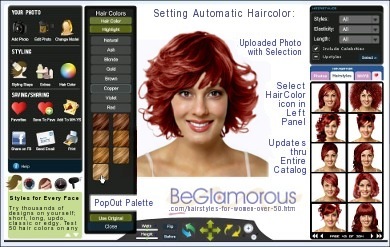 Virtual Hairstyles for Women Over 50 - Change Hair Colors & Styles Online. Upload Your Picture, Test Hairstyles for Women over 50 (or 30, 40, 60, 70...) or any age! Men's Styles, Too. The catalog offers something for everyone -- including over 700 up-styles and half-up designs! Go modern, traditional, conservative or edgy -- bangs or no bangs. With your uploaded picture in place, just search for the length, texture or type of haircut you need. You can also access WIZARD MODE under the consultations tab, and instantly try hairstyles and colors based on your face shape, eye color, skin complexion, hair characteristics and other information you enter, such as whether you wear glasses, and special situations such as dry, fine or thin hair, or split ends. See all features or try it here. There are limitless combinations of hair looks, colors and highlights -- you'll find designs for any lifestyle, any age, any attitude, any occasion! If you need help or have questions, click the blue "Help" button -- or, customer service is ready to assist. 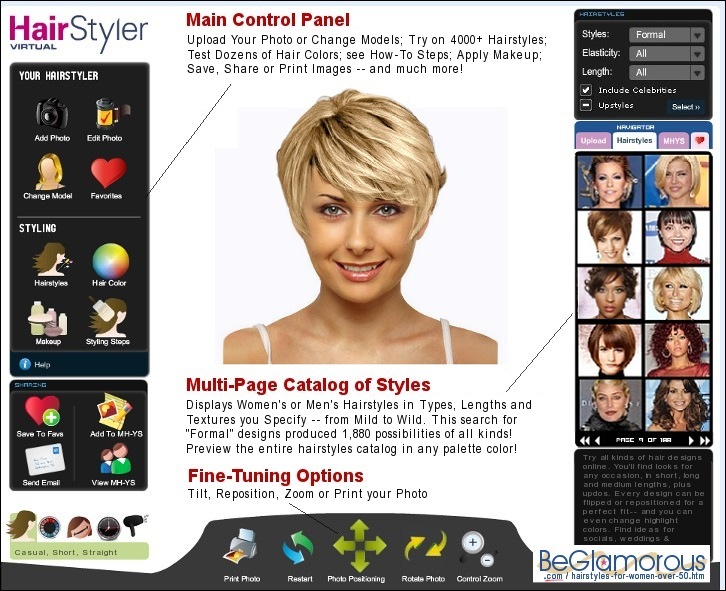 With the Virtual Hairstlyle Selector, it's easy to try new hair looks and change hairstyles online! The Hair Style Selector lets you compare women's and men's perms -- everything from modest to wild looks -- plus a popup Hair Color Chart and virtual makeup palettes. You can find designs for everyday wear or for special situations such as weddings/bridal, banquets and other formal events -- with both celebrity looks and salon creations, with many ideal hairstyles for women over 50 (or as some say, "coiffures pour femmes de 50 ans et plus," or "Frisuren für Frauen über 50," or "peinados para mujeres mayores de 50 años"). This online software program is amazing (you can do basic editing on your uploaded photo to prepare it for usage. The site does not offer services such as free makeover games or downloads); most styles include tutorial tips for diy home hairstyling. There are looks for everyone from teens to 'older' or 'middle-aged' persons -- and a wide variety of bangs -- front, side-swept, feathered, wispy, blunt, asymmetrical, etc. With thousands of styles for comparison, dozens of colors, and the ability to change highlight colors, the combinations are virtually endless.